The Firing Squad @ Grand Gulf Living History taken on November 6, 2010. A group photo at Grand Gulf Living History taken on November 6, 2010. Camp #227 members Don Green & Dennis Avera participate with the 27th Miss Honor Guard at the Bailey Memorial near Picayune, MS. on October 9, 2010. Group photo above is of the Memorial Participants & the Bailey Family Descendants. The honor guard for the Chatom Courthouse dedication is made up of some troops from SCV Camp #227 taken in Chatom, AL. on August 21, 2010. Members of Camp #227 help form the 27th Miss. Honor Guard to post the colors at the Southern Heritage Conference in Laurel, MS. on August 14, 2010. Members of Camp #227 take part in the honor guard for the Texas Monument Dedication at Rosehill Cemetery in Meridian, MS. on June 27, 2010. Members of Camp #227 pose in front of the newly dedicated Kentucky Monument @ Vicksburg Military Park on May 8, 2010. Members of Camp #227 pose in front of the Courthouse Statue in Laurel, MS. on Confederate Memorial Day on April 26, 2010. 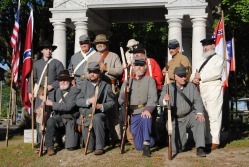 Members of Camp #227 pose at a living history for Pinefest @ Landrum's Village in Laurel, MS. on April 17, 2010. SCV Camp #227 provides the firing squad @ the Marion Memorial Cemetery above Meridian, MS. on April 11, 2010. Members of Camp #227 pose with members of other camps & brigades with Fenner's Battery & their Cannon at the Pardue Memorial near New Augusta, MS. on April 3, 2010. Members of Camp #227 pose with Members of the Augusta Greys Camp #1956 @ Camp Dantzler Grill & Drill for Memorial Service @ Anderson Cemetery near Purvis, MS. on March 20, 2010. Members of Camp #227 pose with other participants @ Routhland Plantation during Spring Pilgrimage on March 13, 2010. Members of Camp #227 pose with members of other camps, brigades, & divisions for the Draughn Memorial near New Augusta, MS. on Feb. 27, 2010. Members of Camp #227 fire a salute @ the Gibson Memorial in Choctaw County, AL. on Feb. 5, 2010. SCV Camp #227 poses for a pic @ the Lee-Jackson Banquet held @ Bethlehem Baptist Church in Laurel, MS. on Jan. 30, 2010.